I take the title of the introduction I wrote for this season's Hello Lincoln. 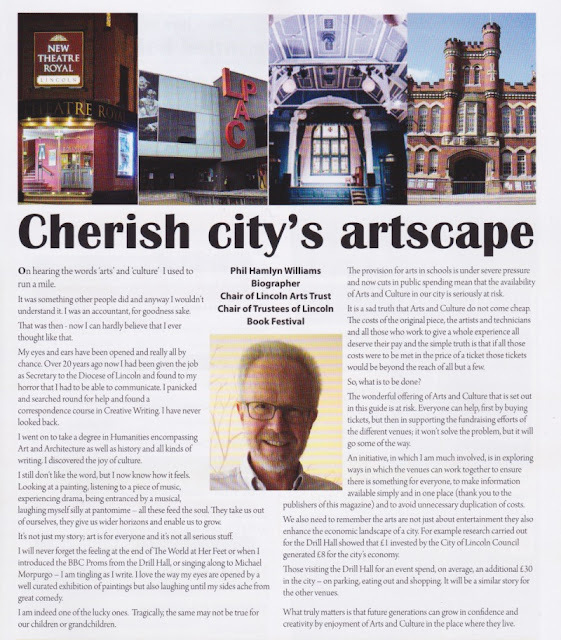 I reproduce the article below, but I want first to set out just why our city's artscape is in need of being cherished. It is about being a city which embraces excellence in all its forms and not just a city what was notable in the past. In order to be a place of excellence, I believe a number of factors need to be present. Excellence in education, which we have in our universities and college; excellence in work and employment, which we have in Siemens, Lindum and James Dawson but also a host of very creative businesses; excellence in architecture and heritage, which we have in abundance. It also needs excellence in the provision of arts and culture. It is simply no good if people living here have to go elsewhere to ‘feed their souls’. I have written elsewhere of Charlotte Bronte who only found her eyes opened to art in the then new National Gallery when she visited London. In Lincoln we are amazingly lucky because, unlike Charlotte Bronte, we don’t have to go to London to have the experience she had; we have it on our door step. The Usher Gallery is surely, in its own way, as beautiful a building as the National Gallery and its setting on the hill nestling below the cathedral surely knocks Trafalgar Square for six. It has in recent years welcomed exhibitions that would make cities many times our size green with envy. It speaks of a city that is significant. We do of course need more that just that. Many of the people of this city live in some of the most deprived wards in the UK. It is vital that our provision of art and culture reaches as far as it can and is as accessible as it can be. 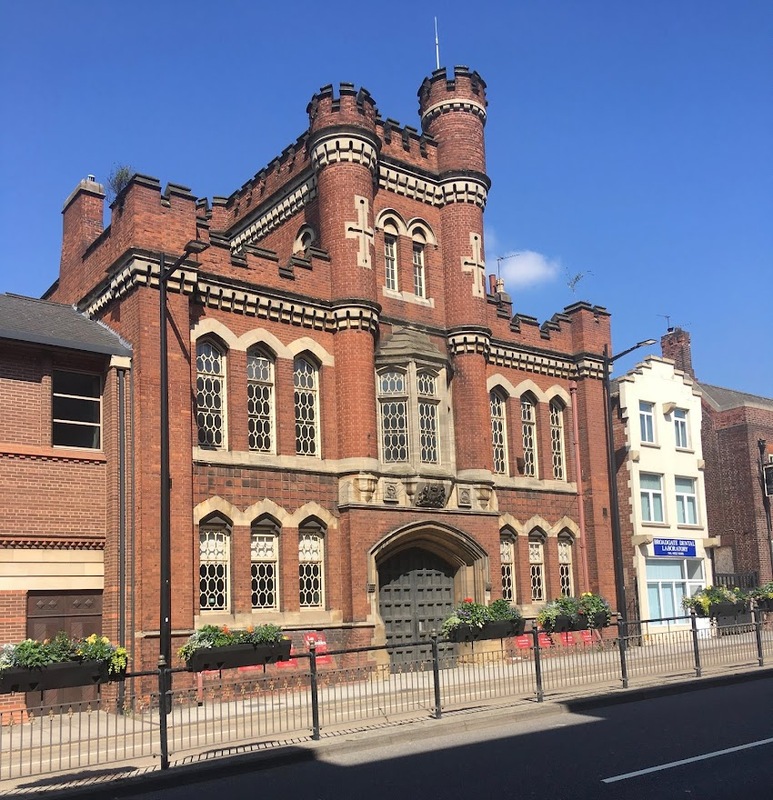 At the Drill Hall, we are delighted to be working in partnership with the YMCA to bring the experience of theatre to young people living in their part of the city and also to be working with the Mansions of the Future project to make art accessible in the very centre of Lincoln. The Usher has the potential to be a massive force for good. It has been neglected and does need investment to be fit for purpose in the 21st century. The building is one with its collection, and this is important. It was built for the purpose for which it is still used and is a necessary complement to the art on display. It can speak loud and clear to the Lincoln community and to our many visitors. The reference to visitors is important. We will soon have two wonderful heritage sites and visitors, I am sure, will come in their thousands. However, once they have visited the cathedral and castle, what next? To my mind, it is vital to have strong cultural offering to encourage those vital repeat visits. I would argue that high quality public performance is part of this, but also the opportunity to experience great visual art in the place built to show it. Both the Drill Hall and the Usher have a further vital role to play. They need to be places where today’s and indeed tomorrow’s artists can work. In today’s world, art cannot be something that is just ‘consumed’; there is a hunger to participate. Both places are ideally suited to this.